When you loan a product, Boulevard decreases the inventory quantity by the number of loaned products and adds this number to the Loaned field in the Product form. See Invoice a Loaned Item for more information. From the Shortcuts form, click Loan/Borrow & Exchanges (or from the Product menu, select Loan/Borrow & Exchanges). From the toolbar click Loan. 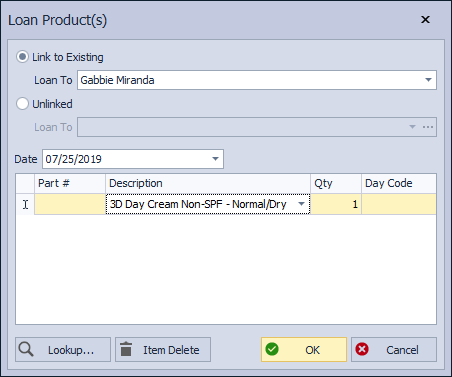 In the Loan Product(s) form begin typing the name of the contact you are loaning items to (if the contact does not have a profile in Boulevard, and you do not want to create one, enter their name under Unlinked as shown in the image below). If necessary, change the date of the transaction in the Date field. Add the items to the table (Enter a part number, partial description or Lookup). If necessary, edit the quantity for each item in the Qty field (and optionally, add the day code in the Day Code field). If you need to delete an item from the list, select it and click Item Delete.